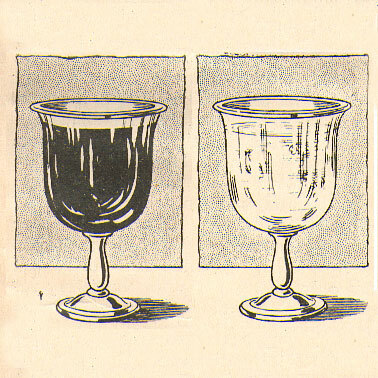 Many of our readers have seen Chung Ling Soo perform the mystifying trick of a vase filled with ink suddenly change to vase containing the same amount of clear water. The method here described, is highly novel and ingenious. We understand Herr Ernest Basch, of Hanover, is the inventor of this latest idea. 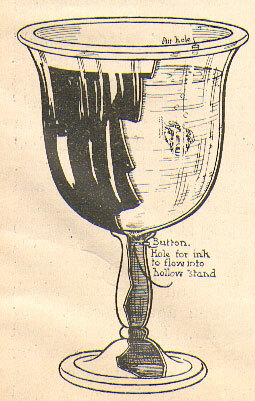 Instead of the usual glass stand a metal one is used, highly plated. At a short distance the appearance is very similar to that of glass. On careful examination of explanatory illustration, it will be seen that a button is fitted to a spring at top of stand, when pressed it opens a recess which allows the ink or coloured water to flow into the stand with great rapidity, revealing the clear water and gold fish. Magicians desirous of introducing new novelties into their programmes should purchase the “Magician” regularly.